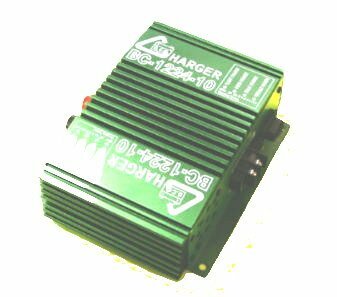 Inexpensive multistage microcontroller based lead acid battery charger voltage charger with 20 VDC to 30 VDC input. Charge 12 volt lead acid batteries. Charge any lead acid battery from a large one, or from a Humvee, truck, fork lift, truck, tractor or back-hoe. Heavy Duty, Industrial, Marine, and Military DC input battery chargers click here. Protects even small 12 volt batteries from gassing or damage. Charge time is typically 58% charge in 1 hour, 82% in 2 hours, 93% in 3 hours, 98% in 4 hours. Charge efficiency is 95% for the a SLA, VRLA, or Gel Cell battery and 85% for the charger, making a combined efficiency of 81%. So a 24 volt 100 AH battery would be able to charge a 12 volt 10 AH battery 16 or 18 times before the host battery needed recharge. Auxiliary batteries, hobby batteries, bicycles, and scooters in a car, van or bus. Charging 12 volt sealed lead acid batteries from a vehicle. Charging 12 volt "jump start" batteries from a 24 volt tow truck or service vehicle. Charging 12 volt electric bicycle from a 24 volt vehicle. Four stage charge--constant current, constant voltage, fill, and float. This charges your battery the fastest way possible without damaging the battery. It is suitable for any size 12 volt lead acid battery. The BC-2412-15 converts 24 volt power into 12 volt power, so for a 7.5 amp output the input needs over 4 amps. Make sure that the wires connecting the BC-2412-15 are adequate for the current and the length of the run. 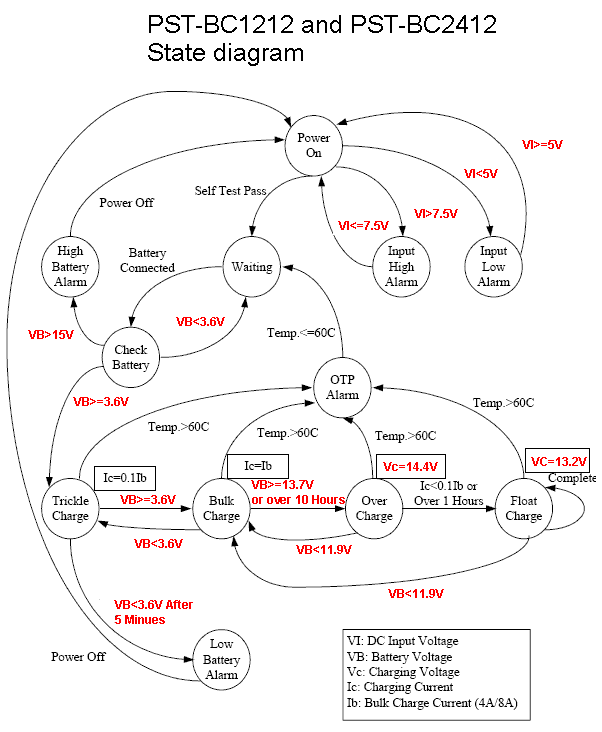 If the voltage drop in the wires are too much the "Low Battery Voltage" alarm will come on. Wires that are too small may also overheat and melt the insulation, causing a dangerous situation. 12 gauge is usually adequate for runs up to 20 feet of wire (adding together the positive and negative wire lengths). Try to connect or disconnect the battery when the charger power is "on." It is possible but extremely rare for the charger to go into a temporary fault mode if the battery is connected first, but cycling the power switch will clear this "false fault." Mount the BC-2412-15 in an area that will get adequate ventilation and will be free from rain, spray, or excessive dust.